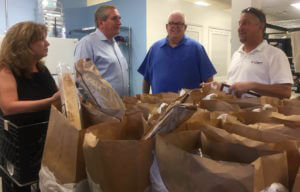 As about 50 people waited to receive a food package in the community center of St. Margaret’s Episcopal Church, board members from the H.N. and Frances C. Berger Foundation surprised organizers of the Neighbors 4 Neighbors program with a $10,000 grant. As Christopher McGuire and Catharine Reed, delivered the $10,000 grant check, a crew from CBS Local 2 was recording and Livestreaming the presentation on Facebook. The grant is an offshoot of a partnership between the Berger Foundation and CBS Local 2, where each month, a local nonprofit receives a $25,000 grant. But this gift was in addition to the monthly awards. 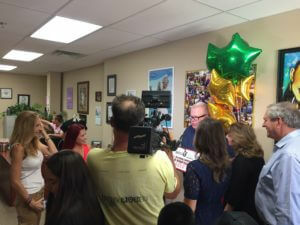 CBS Local 2 Reporter Alexandra Pierce and her crew had cameras rolling, as representatives from the television station and the foundation carried balloons and an exaggerated check into the room unannounced. “This summer we added three surprise grant presentations so we could affect more people in our community who were requesting assistance, because it’s difficult to choose only 12 nonprofits from the approximately 100 Coachella Valley Spotlight applications we receive each year,” said Christopher McGuire, Vice President of Programs for the H.N. and Frances C. Berger Foundation. 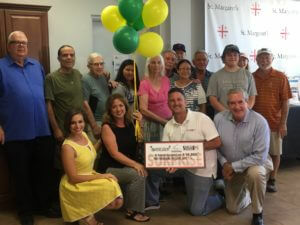 St. Margaret’s Episcopal Church’s Neighbors 4 Neighbors program applied for a 2017 Coachella Valley Spotlight grant, but was not selected as one of the monthly recipients. However, the organization’s application stood out, noting a need for more refrigerators and freezers to keep up with the increased number of people the organization is serving. The church’s Neighbors 4 Neighbors program started in 2007, and currently assists about 48,000 area residents annually with basic necessities including food, clothing and shelter. With the help of many volunteers, the Neighbors 4 Neighbors program also helps area residents apply for the federal Supplemental Nutrition Assistance Program and refers them to medical and social services in the community. “We are proud of the Coachella Valley Spotlight partnership with the H.N. and Frances C. Berger Foundation, which has made a difference in thousands of people’s lives. We are excited to open the grant application period for 2018, and look forward to learning more about all the wonderful work happening in our community,” said Mike Stutz, General Manager of Gulf California Broadcast Company, which owns and operates CBS Local 2. For more information about the Coachella Valley Spotlight grant or to apply to receive one in 2018, go to cbslocal2.com, and click on the Coachella Valley Spotlight logo near the bottom of the home page. To learn more about St. Margaret’s Episcopal Church and its Neighbors 4 Neighbors program, visit www.stmargarets.org or call 760-346-2697. A grant presented by the H.N. and Frances C. Berger Foundation will support local organizations that aim to improve the health and welfare of Coachella Valley residents. Berger Foundation board members Christopher McGuire and Catharine Reed presented the $25,000 Coachella Valley Spotlight grant to Health Assessment and Research for Communities (HARC), which provides research and evaluation to improve health, wellness, and quality of life in the Coachella Valley and beyond. HARC, a Palm Desert nonprofit organization, formed in 2006 to address the pressing and ongoing gaps in access to regional health information. Every three years, HARC conducts a Coachella Valley Community Health Survey. The data is tabulated and provided to the community at no charge. “We are dedicated to providing objective, reliable research, analysis and technical services to communities in order to facilitate better decision making regarding health and quality of life,” said Jenna LeComte-Hinely, PhD., CEO of HARC. The Coachella Valley Spotlight grant is helping cover the cost of collecting and analyzing the data and disseminating it to the community in easy-to-understand ways. One way HARC plans to share the survey information with the community is by holding workshops to provide hands-on training to organizations about how to use HARC’s online database, which contains the survey results, and how to interpret the data. The first workshop is being planned for Fall 2017. “Often important work done by HARC goes unnoticed because they are behind the scenes, but the work, and in this case, the data, is instrumental to so many Coachella Valley organizations as they plan their programming needs,” said Catharine Reed, Program Director of the H.N. and Frances C. Berger Foundation. The Coachella Valley Spotlight partnership is adding to HARC’s outreach of survey information as CBS Local 2 is providing the benefit of media exposure about the organization and what it does. HARC will be featured on CBS Local 2’s “Eye on the Desert,” in public service announcements and on the cbslocal2.com website throughout August. “The more people and organizations that come to know about HARC and its available research, the more these agencies can design and adapt their programs to meet the needs of the community,” said Mike Stutz, General Manager of Gulf California Broadcast Company, which owns and operates CBS Local 2. To find out about HARC visit www.HARCdata.org or call 760-404-1945. For more information about the Coachella Valley Spotlight grant or to apply to receive one in 2018, go to cbslocal2.com, and click on the Coachella Valley Spotlight logo on the home page. Korzec was one of 59 people who received word last December that her 52-year-old organization was not one of the 12 selected as a 2017 Coachella Valley Spotlight grant, for which she had applied. The Coachella Valley History Museum was founded to present, share, and interpret the rich history of the Coachella Valley. The organization operates with the help of about 100 volunteers who help as docents at the museum, with events, and as educators in the Junior Historians and art programs. 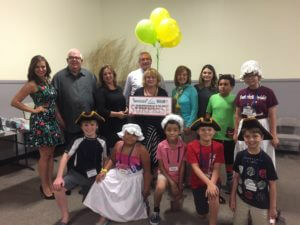 The Coachella Valley History Museum plans to use the grant funds to improve its Junior Historian program and after school art programs. Organizers say they will purchase electronic tablets, tables, chairs and art supplies, which will help further develop the programs and attract more students. For more information about the Coachella Valley Spotlight grant or to apply to receive one in 2018, go to cbslocal2.com, and click on the Coachella Valley Spotlight logo near the bottom of the home page. To learn more about the Coachella Valley History Museum visit www.cvhm.org or call 760-342-6651. At-risk valley youth, whose parents are incarcerated, will benefit from a $25,000 Coachella Valley Spotlight grant from the H.N. and Frances C. Berger Foundation. The grant was awarded to Calicinto Ranch, Inc., which offers boys and girls of prisoners a chance to break the cycle of crime in their families by providing the kids with an experience that demonstrates life choices. The grant is sponsoring 50 Coachella Valley kids, whose parents are incarcerated, with a 3-day experience at Calicinto Ranch. The specialized camp offers these young people guidance, instruction, character training, positive interaction with law enforcement officers and an opportunity to enjoy outdoor recreation and ranch activities with genuine love and care. At the camp, kids are accompanied by screened mentors from their local cities, so they may bond and continue to develop relationships beyond their week on the ranch. With the goal of incarceration prevention, Calicinto Ranch and its volunteers also provide year-round programs, services and events for children of incarcerated parents. California spends between $35,000-$50,000 per inmate annually. The cost of camp at Calicinto Ranch is only $500 per child and is considered by many donors as an investment in incarceration prevention. Sponsoring a camper covers transportation, food, program materials, crafts, pictures and memory books, t-shirts, as well as program management and camp staff costs. These hard costs say nothing of the hope and encouragement that also comes with the program. “The people at Calicinto Ranch are providing foundational learning to help put kids on a positive, purposeful and productive path for their future. I’m happy we can be a part of this,” said Catharine Reed, Program Director of the H.N. and Frances C. Berger Foundation. The Coachella Valley Spotlight partnership also offers recipients media exposure. Calicinto Ranch was featured on CBS Local 2’s “Eye on the Desert,” in public service announcements and on the cbslocal2.com website throughout July. “Watching these kids experience this life-changing program is extremely rewarding,” said Mike Stutz, General Manager of Gulf California Broadcast Company, which owns and operates CBS Local 2. 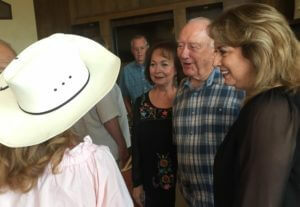 To learn more about Calicinto Ranch, visit www.calicintoranch.org or call 951-654-6838. Twelve Coachella Valley nonprofit organizations will be selected to receive $25,000 each from the H.N. and Frances C. Berger Foundation. Applications are available through September 8, 2017 for the 2018 Coachella Valley Spotlight awards. Nonprofit 501(c)3 organizations that serve people in the Coachella Valley are eligible to apply. For the first time, nonprofits that received the award between 2009-2016 are also able to reapply. Since the program began more than $2.25 million in grants have been awarded to more than 90 local nonprofit organizations. The grantees will be selected by the CBS Local 2 Community Advisory Board, which includes representatives from the H.N. and Frances C. Berger Foundation and members of the community. 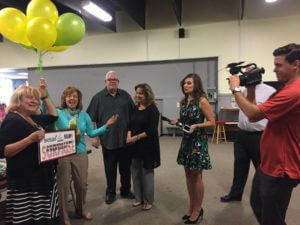 Twelve recipients are selected, and then one is recognized each month during 2018 on CBS Local 2’s Eye on the Desert, as well as in public service announcements and on the station’s website, www.cbslocal2.com. Past recipients of the Coachella Valley Spotlight include organizations that support children, seniors, veterans, the homeless, uninsured and underinsured residents, people living with debilitating medical conditions, animals, education, the arts, and more. Coachella Valley Spotlight applications are available at www.cbslocal2.com and must be postmarked by Friday, September 8, 2017. Recipients will be notified in December. For more information call 760-773-0342. Representatives from the H.N. and Frances C. Berger Foundation surprised a local nonprofit organization with a $10,000 check – while on CBS Local 2’s Live Facebook Feed. The grant – presented to the Desi Strong Foundation – is an offshoot of a partnership between the Berger Foundation and CBS Local 2, where each month, a local nonprofit receives a $25,000 grant. But this grant was unknown and unannounced. Last December, the Desi Strong Foundation was among 59 local nonprofits that received a regretful letter that they were not selected to receive one of the monthly Coachella Valley Spotlight grants. The Desi Strong Foundation was formed after the passing of courageous Desi Cechin, who in 2014 was diagnosed with stage 4 neuroblastoma. Desi fought two strong years, and then to honor her memory and give other children with cancer a fighting chance, her family and community members started the Desi Strong Foundation to raise awareness and funding for children battling cancer. The Desi Strong Foundation raises money for childhood cancer research, which only receives 4 percent annually from the National Cancer Institute – to study these diseases that threaten the lives of more than 175,000 children each year. Even when families are fortunate to have insurance to cover the majority of treatment, extraneous expenses including travel costs to special hospitals may become a true burden on families already feeling helpless with their sick child. Since the organization’s inception, more than 22 children with cancer have benefited from support through the Desi Strong Foundation including financial gifts, like the grant from the H.N. and Frances C. Berger Foundation, which was presented to help with families’ ancillary costs. “This was such an exciting gift and presentation to be a part of. There are not many things that can top surprising someone with thousands of dollars! We are proud to partner with the H.N. 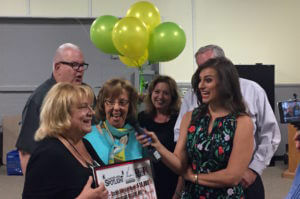 and Frances C. Berger Foundation in this program, now in its ninth year,” said Mike Stutz, General Manager of Gulf California Broadcast Company, which owns and operates CBS Local 2. To learn more about the Desi Strong Foundation visit www.desistrong.org or call 760-679-DESI. For more information about the Coachella Valley Spotlight grant or to apply to receive one in 2018, go to cbslocal2.com, and click on the Coachella Valley Spotlight logo near the bottom of the home page. 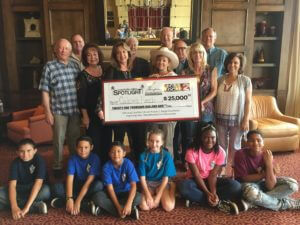 At-risk east valley teens will benefit from a $25,000 Coachella Valley Spotlight grant from the H.N. and Frances C. Berger Foundation. 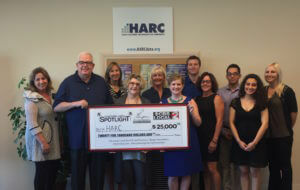 The grant was awarded through a partnership with CBS Local 2 to Desert Center for Legal Education, for its Project #180. The pathway program at Amistad High School is a collaborative approach academy that gives at-risk teens the opportunity to gain hands-on legal experience. The idea of Project #180 was born when Criminal Defense Attorney John Patrick Dolan read an article in The Wall Street Journal about an Inmate Debate Team that had won against The Harvard Debate Team at the Eastern New York Correctional Facility, a maximum-security prison where convicts can take courses taught by faculty from the nearby college. By offering an alternative program to the dangers of drugs, violence, gangs and teen pregnancy, Project #180 seeks to enrich young at-risk high school students mentored by judicial officers, police officers, attorneys, law students and Riverside County officials. “High school pathway programs, such as Project #180, teach students real-life skills, which help students as they graduate high school and beyond,” said Catharine Reed, Program Director of the H.N. and Frances C. Berger Foundation. Desert Center for Legal Education will use the majority of the grant funds to pay for courtroom attire, books, transportation costs, mock trial competition fees, and meals for the participating students. The organization also plans on using the funds for gang prevention and intervention efforts. “Programs like Project #180 are critical in intervening with young people who have been involved in gangs and ensuring they have the ability and encouragement to lead nonviolent, productive lives,” said Mike Stutz, General Manager of Gulf California Broadcast Company, which owns and operates CBS Local 2. To learn more about the Project #180 Pathway Program through Desert Center for Legal Education visit www.cdtalaw.com. 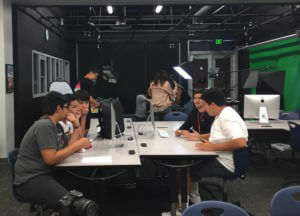 DIGICOM will now bring its digital storytelling program into more valley middle and high schools thanks to a $25,000 Coachella Valley Spotlight grant from the H.N. and Frances C. Berger Foundation. DIGICOM teaches students the fundamentals of using easily available digital technology such as cell phones, tablets and computers to create thoughtful short stories about their communities, their lives, and dreams, as a means of learning academic content. Through their elaborate media arts program, DIGICOM fosters critical thinking, creativity, communication, and collaboration, which are cornerstones of the Department of Education’s Common Core State Standards. 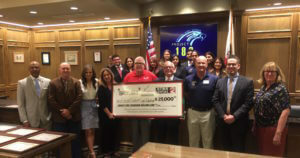 The organization, which has benefited more than 7,000 Palm Springs Unified students annually since 2009, will use the grant to expand the program to Desert Sands and Coachella Valley Unified School Districts. Students of DIGICOM are given the opportunity to enter their films in one of the three film festivals each May. More than 1,500 students, teachers and family members attend the annual Film Festivals, which provide students the opportunity to show their work and be recognized. “DIGICOM was so successful in Palm Springs Unified School District; it’s wonderful we can extend the DIGICOM experience – as a potentially life-changing opportunity – to more young people in the community,” said Catharine Reed, Program Director of the H.N. and Frances C. Berger Foundation. 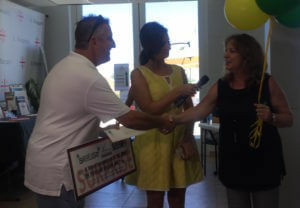 Along with the grant, the Coachella Valley Spotlight partnership offers recipients publicity opportunities. DIGICOM was featured on CBS Local 2’s “Eye on the Desert,” in public service announcements and on the cbslocal2.com website throughout the month of May. “Digital storytelling is becoming more and more prominent in our world, and teaching students how to use this medium productively is commendable, and something we are very excited about,” said Mike Stutz, General Manager of Gulf California Broadcast Company, which owns and operates CBS Local 2. For more information about DIGICOM and the DIGICOM Film Festivals, visit http://www.digicomfilmfestival.com. The First Tee of the Coachella Valley will now bring its youth golf program into area schools thanks to a grant from the H.N. and Frances C. Berger Foundation. 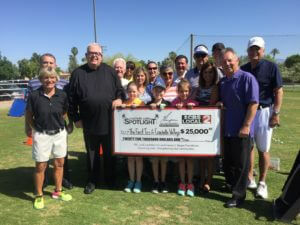 The organization, which teaches life lessons through the game of golf, received a $25,000 Coachella Valley Spotlight grant. The First Tee is a national organization with chapters in about 1,200 communities, which seeks to impact the lives of young people by providing learning facilities and educational programs that promote character development and life-enhancing values through the game of golf. The local chapter, The First Tee of the Coachella Valley has offered golf lessons to kids and teens regardless of previous experience and background since 2008. Participants, ages 4-17, are introduced to nine core values of honesty, integrity, sportsmanship, respect, confidence, responsibility, perseverance, courtesy and judgment, which are incorporated into the program. Players learn values such as honesty and responsibility by calling penalties on themselves and reporting their own score. “The First Tee has been positively impacting youth and their families at its clubhouse facility, and now it can make an even greater impact by going directly into the schools,” said Christopher McGuire, Vice President of Programs for the H.N. and Frances C. Berger Foundation. More than 6,000 local youth participate annually through the year round and after-school programs and through collaboration with local charities. Three Indio schools have already implemented The First Tee National School Program into this year’s curriculum, and there are plans to implement in more schools during the 2017-2018 school year. “It’s wonderful we can to extend The First Tee experience as a potentially life-changing opportunity to more young people in the community,” said Mike Stutz, General Manager of Gulf California Broadcast Company, which owns and operates CBS Local 2. Along with the grant, The First Tee of the Coachella Valley was featured on CBS Local 2’s “Eye on the Desert,” in public service announcements and on the cbslocal2.com website throughout the month of April. The First Tee’s clubhouse is located at, 74-945 Sheryl Avenue in Palm Desert. For more information and a calendar of events, visit http://www.thefirstteecoachellavalley.org. Blooming desert wildflowers served as the perfect backdrop for Friends of the Desert Mountains to receive the $25,000 Coachella Valley Spotlight grant from the H.N. and Frances C. Berger Foundation. Each year more than 20,000 valley residents and visitors enjoy the Santa Rosa & San Jacinto Mountains National Monument Visitor Center, off Highway 74, and hiking trails, which the organization supports. Friends of the Desert Mountains recognizes the ever-increasing popularity of the Coachella Valley hiking trails among residents and visitors, and aims to improve safety, usability, and the enjoyment of the entire trail system. Grant funds will benefit the organization’s Trail Stewardship Program. 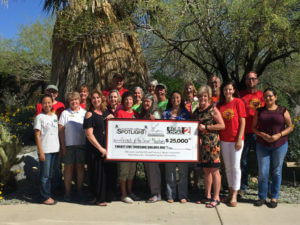 “We plan to use a portion of the grant proceeds to enhance the Ed Hastey Trail, which is the trail accessible to strollers and wheelchairs, to include tactile and other sensory experiences specifically designed for those with vision, hearing, and other sensory impairments,” said Tammy Martin, Executive Director of Friends of the Desert Mountains. Friends of the Desert Mountains maintains more than 500 miles of recreational, hiking, biking, equestrian trails in the Coachella Valley. Although much of the work for the program is carried out by volunteers, the program incurs costs associated with the upkeep and replacement of tools, sign and exhibit printing, signposts and associated materials, and staff time related to coordination and design. Beyond conservation and preservation, the mission of Friends of the Desert Mountains includes research and education. The organization provides outdoor education to several hundred students from various Coachella Valley school districts each year. “After acquiring more than 50,000 acres of land to maintain in conservation, Friends of the Desert Mountains is a natural authority to teach stewardship of our precious resources,” said Mike Stutz, General Manager of Gulf California Broadcast Company, which owns and operates CBS Local 2. Along with the grant, Friends of the Desert Mountains was featured on CBS Local 2’s “Eye on the Desert,” in public service announcements and on the cbslocal2.com website throughout the month of March. Friends of the Desert Mountains is located at the Santa Rosa & San Jacinto Mountains National Monument Visitor Center, 51500 Highway 74, Palm Desert. For more information and a calendar of events, visit www.desertmountains.org.